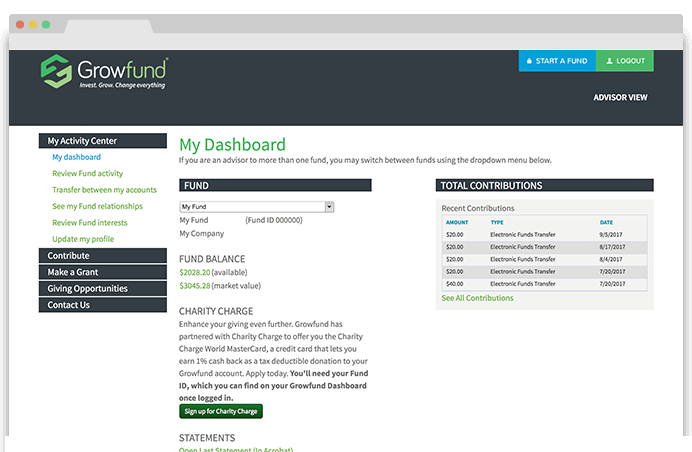 Whether you want to start with a little or a lot, Growfund makes it easy for you to make a meaningful difference. Giving has never been so easy. After you create your account for free, you can make tax-deductible contributions at your own pace. Select the investment option right for you, and your funds can grow with the market. You can make grants with as little as $25. Pick your favorite organizations that support your giving priorities. Invite your family and friends to take part. Create a featured giving opportunity to tell the world!